After the introduction of conscription in 1916, men between the ages of 18 and 41 became eligible for military service. A network of Military Service Tribunals were established to hear the cases of men who wished to be exempted from being called up. Although approximately 2000 tribunals operated across the country, few records survive, which is why the records of proceedings as reported in local papers are invaluable. Some men appealing were conscientious objectors, while others were seeking exemptions because they worked on the land, cared for family members or worked in reserved occupations. Members of the Tribunal were usually drawn from the ranks of the middle classes who would hear each case before deciding on its merits. The person appealing could be represented by a solicitor or even a relative or employer and both the applicant and military representative had the right of appeal to a further tribunal. 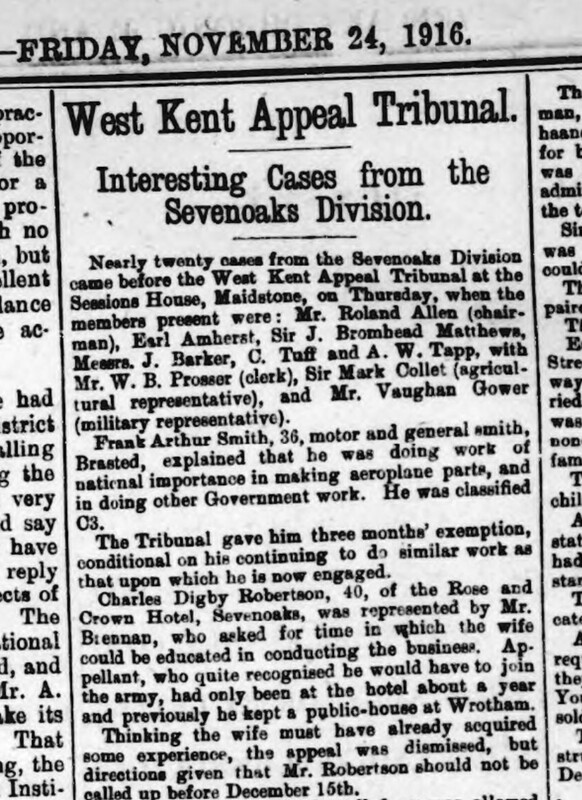 The Kent Messenger reported that nearly twenty cases from the Sevenoaks division came before the West Kent Appeal Tribunal in Maidstone in November 1916. These cases were appeals against prior decisions at a local tribunal. The Messenger noted that the panel included Earl Amherst and Sir Mark Collet and detailed a number of the cases concerning residents from Sevenoaks from all walks of life. From orchid growers and veterans of the Boer War, to one man who was subsequently killed in action and remembered on the Sevenoaks war memorial, the Messenger reported their cases, some of which caused some laughter at the time. Charles Digby Robertson, 40, of the Rose and Crown Hotel, who was represented by Mr Brennan asked for time in which the wife could be educated in conducting the business. Appellant, who quite recognised that he would have to join the army, had only been at the hotel about a year and previously he kept a public house at Wrotham. Thinking the wife must already have squired some experience, the appeal was dismissed, but directions given that Mr Robertson should not be called up before December 15th. The tribunal dismissed the appeal of Caleb Newman, 39, of the Greyhound Hotel, Sevenoaks, but in order that he may arrange his affairs, they directed that he should not be called up for a month. Mr H J Brader, who represented the appellant, elicited that he was classified B1, that he served in the South African War, receiving the medal and five clasps, and afterwards remained in the South Africa Mounted Police for three years. The case of John William Terry, 18, working for his father, a Sevenoaks farrier, was dismissed, although the Local Tribunal (had) described it as ‘a hard case’. It was stated that eight blacksmiths had left Sevenoaks for the army and munition work, and that Mr Terry’s other son, having joined the colours he took this lad from the butchering trade to assist him in the farrier’s shop. Robert James Buckle, single, orchid grower for Mr Phillips, Sevenoaks, was represented by Mr Knight, who called in question appellants ability to serve in C1, to which class he had been allocated. He produced a certificate from a local doctor, showing that for sixteen years he had suffered from varicose veins, which were very bad now. The panel declined an invitation to view the appellants legs for themselves and dismissed the appeal, stating that while it was true C1 men were being called up, he would undergo another medical examination on joining the colours. Mr M Blake sought exemption for his cowman, Albert Elvy, 32, single, Dunton Green, and said if the man left he should be compelled to reduce his herd. He stated, in answer to questions, that he did not think it right to ask ladies to do continuous milking, and to laughter said that one he did employ was kicked by a cow, and would not come again! Sir John Matthews: How many builders are there in Sevenoaks? Sir John: Why don’t the builders of Sevenoaks cooperate then? Mr Wallis: We are too much at variance for that! Percy John French, single, a hairdresser, Sevenoaks, asked for a few months’ respite so that in the meantime he could give further training to his brother, who could then carry on the business while he was away. It transpired that this brother was originally apprenticed to the business, and after serving for some time, he joined the army, but was discharged ten months ago and had since been assisting in the work of the barber’s shop. The Tribunal declined to interfere with the decision of the Local Tribunal beyond directing that appellant should not be called up for a fortnight. Mr House, defending stated that he understood that the commanding officer of the Essex Yeomanry, who was stationed near Sevenoaks, was willing to take appellant as regimental barber, which would allow him the opportunity of keeping eye on his own business. The Chairman said that they could not do anything in that direction. Mr Palmer: No, I have not. Palmer went on to state that although he was originally rejected, he had now been passed for general service, notwithstanding the fact that he was deaf in one ear. The chairman: Could not your wife manage this catering business? You see my wife cannot get about as quick as the soldiers! The Tribunal dismissed his appeal but gave instructions that he should not be called up before December 31st. The Messenger also reported some cases heard in the Sevenoaks Urban Tribunal whose members included the Chair, J.F. Carnell (whose brother, Francis George Carnell was killed at Gallipoli and is remembered on the Sevenoaks war memorial) along with Frank Robinson (whose son Frank and nephew, Herbert Lethebe are also remembered on the town memorial). W A Taylor, of Varennes Lodge, South Park, organist at St Luke’s, and music teacher at the Beacon Schools, said he was 41 years of age on June 24th, the day appointed by the military authorities in fixing the age limit. Had he been born an hour earlier he would have been exempt (laughter). The application was refused on the understanding that Mr Johnson would write to the recruiting officer asking him not to call upon Mr Taylor before the end of the school term. 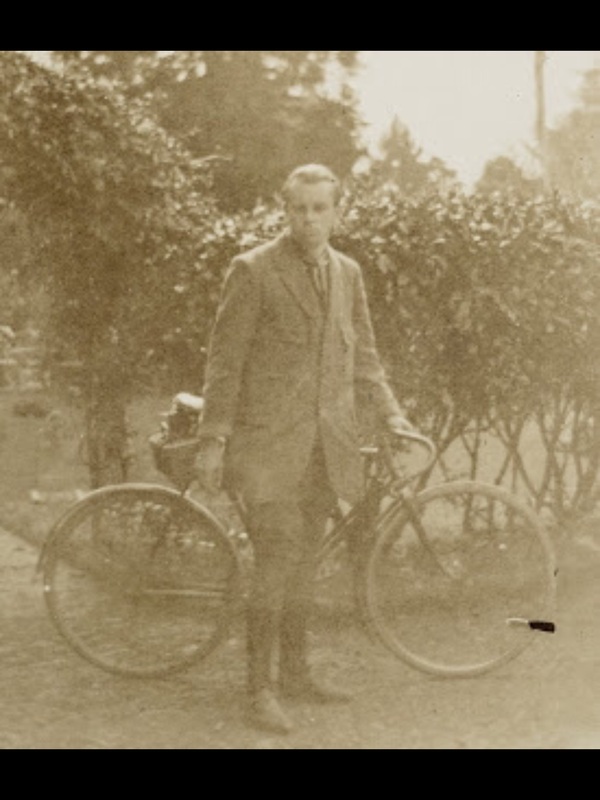 Mr De Barri Crawshay, of Rosefield, Sevenoaks, applied for his son, Lionel Crawshay and said that he (the father) was appointed transport officer to the VAD hospitals in 1915, when here were eight hospitals with 244 beds. The number had now increased to ten hospitals and 400 beds. The son was his chief assistant. He also appealed on the grounds of his son’s ill health, but it was stated that he had been passed for general service. One month was allowed but the Tribunal, while appreciating the service thus rendered, were of the opinion that an older man could do the work. Lionel Crawshay subsequently enlisted in Maidstone on 28th December 1916, first with the Reserve Battalion of the 2nd Life Guards at Windsor, later transferring to 2/4th Battalion, The Queen’s Royal West Surrey Regiment. Crawshay was later one of fifty men selected to be sent to Egypt, with a view to receiving his commission. He was sent initially to France, spending a few days in a rest camp before embarking for Egypt on board the hired transport ship the SS Transylvania. The Transylvania was sunk by a torpedo on 4th May. Lionel, along with 400 others, drowned. His body was recovered and he was buried in the Savona Town Cemetery, which contains the graves of many of those who drowned with him.